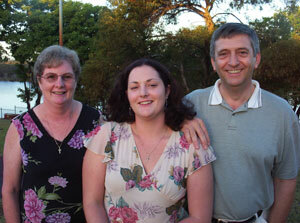 Carol and Des Burgess, with daughter Leanne—and not a fossil, nor fish, in sight. Seeing my bewilderment, Carol and her husband Des explained that when Leanne was 12 years old, she developed an inflamed abscess in her neck. The surgeon in Perth, Australia, who drained the abscess explained that it was caused by bacteria infecting an area of cartilage in her neck, which he described as ‘leftover pieces of gill’—a legacy of our having evolved from fish ancestors. And when Leanne’s school heard of what happened, her teacher called Leanne ‘the fish girl’—a reference also to Leanne being a school champion swimmer at that time. 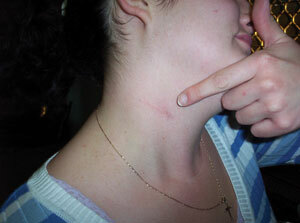 The physical scar on Leanne’s neck shows where the aberrant human cartilage (not fish cartilage) was removed. Thanks to Leanne having a biblical worldview, there was no psychological scarring—Leanne and her family knew to dismiss ‘fish gill’ claims as nonsense. Des said he prefaced his letter to the doctor with ‘I appreciate what you’ve done for us but I thought you ought to be made aware that the “evolutionary leftovers of gills” idea has been refuted by your own people, basically.’ He particularly drew the doctor’s attention to the Creation magazine article reporting that the pathologist who examined the boy’s alleged ‘fish gill’ cartilage said that it was indistinguishable from ordinary human cartilage. Although Des never received a reply, that was not the end of the Burgess family’s contact with the medical fraternity on this issue. Because in 2001, when Leanne was 18 years old and studying first-year nursing, the abscess suddenly inflamed again—swelling to the size of a large apple within two hours. This time surgeons removed some pieces of cartilage from Leanne’s neck (whereas last time they had merely drained the abscess). The Burgess family were living in Melbourne at the time—a city with a top reputation for its medical professionals—but again the same ‘fish gills’ theory was told to them as in Perth six years previously. Leanne, who now works as a full-time nurse, concurred that this was her experience, too. Throughout her nursing degree training, evolutionary presuppositions were rampant—subjects were taught as if evolution were true. Although Leanne herself was ‘inoculated’ against such teaching (by her upbringing in a biblical worldview), she said it would be a hard struggle to turn the situation around. There were only very limited opportunities for students to challenge their teachers—although of course students were free to discuss among themselves what lecturers had said. 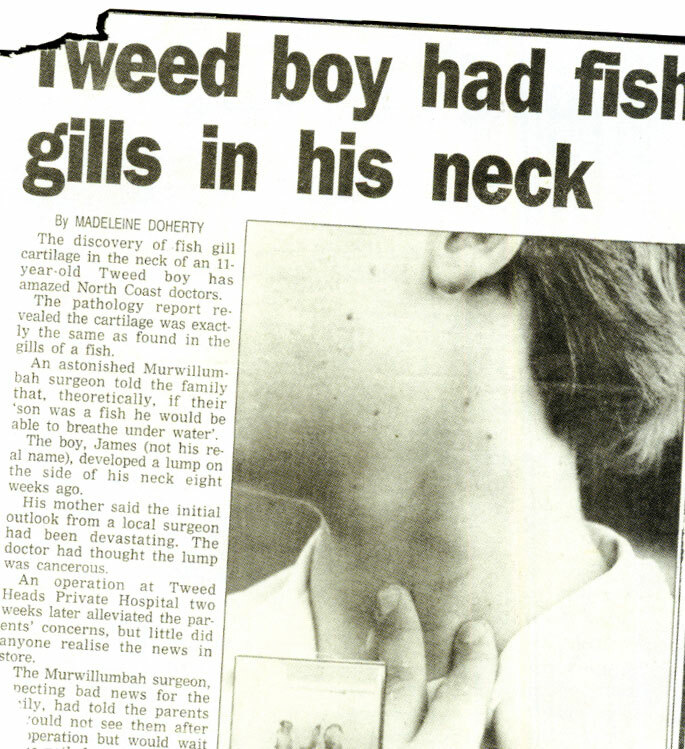 The September 1994 Creation magazine article which the Burgess family photocopied and passed on to their doctor showed how news reports that claimed a ‘boy had fish gills in his neck’ were wrong. Click here for larger view. It also reported that the pathologist who examined the ‘fish gill’ cartilage confirmed that its microscopic appearance was indistinguishable from human cartilage. At one level at least, we are indeed seeing the rewards. The newspaper account of the ‘fish gills’ boy reported that he had experienced ‘some teasing at school’.2 So had Leanne. But in Leanne’s case, because she’d been taught the truth about our origins, she’d been ‘vaccinated’ against such teasing—a worthy outcome in itself. And at another level, we’ve seen Leanne and her parents being willing (and equipped) to challenge evolutionary arguments (1 Peter 3:15; 2 Corinthians 10:5)—by, for example, photocopying a Creation magazine article and handing it on as appropriate. Incorrect diagnoses that some people have ‘fish gill’ cartilage in their neck (see main article) derive from the mistaken belief that the human embryo, as it develops, goes through the stages of its pre-human evolutionary ancestry. (Many readers who studied biology would remember being taught: ‘ontogeny recapitulates phylogeny’.) Thus, according to that view, the human embryo goes through a ‘fish stage’, complete with ‘gill slits’ during the early weeks of development. 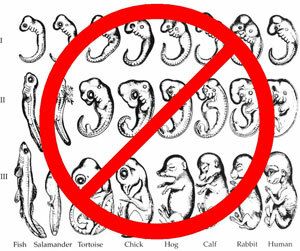 Ernst Haeckel claimed that a human fetus passes through various stages of evolutionary development. He attempted to show this in this series of drawings allegedly representing different stages of embryonic development of a human and other creatures. His drawings are now known to be fraudulent. But embryologists today acknowledge that such ideas have been totally refuted. The human embryo, for example, never has ‘gill slits’ (or ‘branchial [gill] grooves’ as they were also, incorrectly, called). The textbooks used in medical schools have for some years now set the record straight.1 But such is the hold that the old (now discredited) notions have on the current generation of lecturers that false ideas about embryo development are still being passed on to today’s medical students. The confusion has partly arisen because the pouch-like structures which form in the fish embryo look superficially similar to the pharyngeal pouches or grooves in the human embryo. But these structures are quite different. In fish, the pouch-like region develops gills, but in humans the pharyngeal pouches develop important structures—nothing like gills in either form or function—in the head and neck region. These structures include several which contain cartilage, such as the larynx (voice-box). So it is no surprise, in a fallen world, that occasionally there is a mistake in embryo development, which results in a clump of normal human cartilage being incorrectly ‘seeded’ in the side of the neck during development in the womb. Such misplaced cartilage may not necessarily become a problem, unless it becomes infected for example, in which case treatment could include surgical removal. It does not mean that the person with the misplaced cartilage is in any way related to fish! For example: Langman, J., Medical embryology, 4th edition, Williams & Wilkins, Baltimore, p.268, 1981, says that ‘in the human embryo real gills—branchia—are never formed’. Ham, K., A surgeon looks at creation—interview with Dr Warwick Glover, M.B.B.S., FRACS, FRCSED, Creation 14(3):46–49, 1992; <www.creation.com/glover>. Return to text. Wieland, C., A fishy story, Creation 16(4):46–47, 1994; <www.creation.com/fishboy>. Return to text. Staff of US museums and science centres say they are now being frequently confronted by members of the public eager to vocally challenge evolution. Consequently, an increasing number of museums are giving their staff ‘training’ in how to respond to creationists. Dean, C., Challenged by creationists, museums answer back, New York Times, 20 September 2005, p. F1. Return to text. 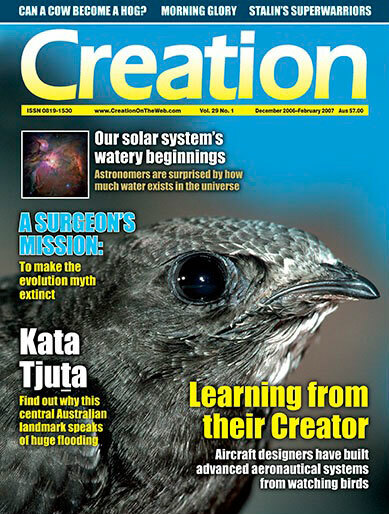 An Australian university chaplaincy worker said: ‘I am increasingly encountering Christian students at the uni who are rock solid in their belief in a young earth—a marked change from previous generations of Christian students—and I think it’s due to up-front creationist ministries like [Creation Ministries International]’, CMI (Australia), Prayer News, April-June 2006, p. 14. Return to text. Sarfati, J., Standing upright for Creation—Jonathan Sarfati chats with human spine expert Richard Porter about his science and faith, Creation 25(1):25–27, 2002; also at <www.creation.com/porter>. Return to text. Downhill, not backwards, Creation 28(2):7, 2006. Return to text. Menton, D., Is the human embryo essentially a fish with gills?, Missouri Association for Creation, Inc., 6 April 2006. Return to text. Sarfati, J., Antidote to abortion arguments, <www.creation.com/antiabort>, 18 July 2006. Return to text.